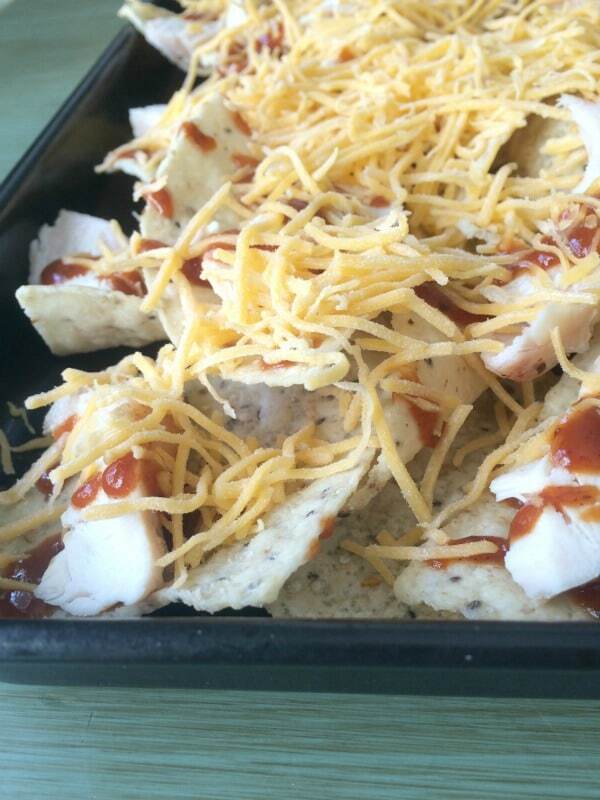 BBQ grilled chicken nachos are the perfect dish for any tailgate party. 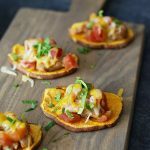 Add your favorite toppings for a game day appetizer! You may want to make a few batches because these will be eaten very quickly. They are that good! It is our favorite time of year. I can sum it up in just two words. It is time to cheer loudly for our teams, get together with friends, and every now and then make the trek out to watch our teams in action….and eat nachos! Who are you rooting for? We are big Longhorn and Cal fans! 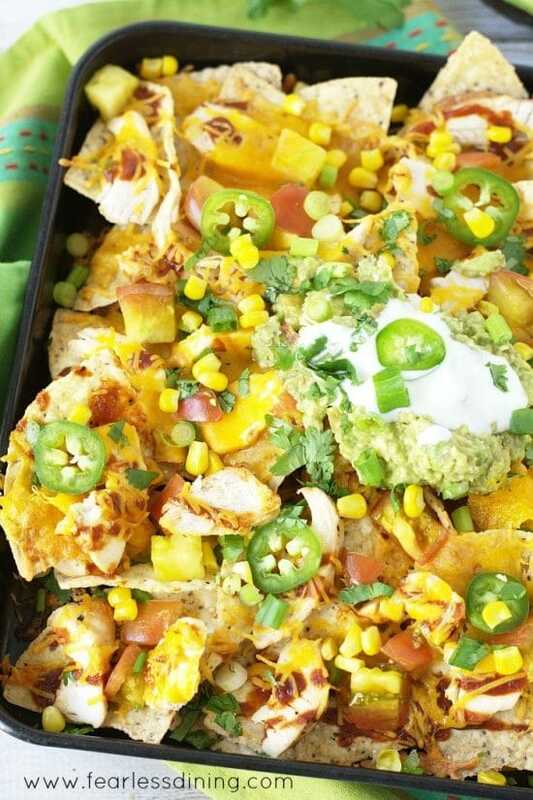 What better dish to serve up for our tailgate party than these deliciously easy chicken nachos! 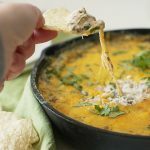 Nachos are one of my favorite appetizers because you can change them up in so many ways. Today we are skipping the spicy salsa and moving into BBQ sauce in honor of the Longhorns. Note that I used Stubb’s Barbecue sauce, but there are so many good gluten-free barbecue sauces out there. Just grab a bottle of your favorite. Not everyone likes the same toppings on their nachos. I have very different kids…don’t even get me started on the picky one. She likes the chips and cheese. That is it. No salsa or barbecue sauce. My son and Mr. Fearless Dining like their nachos loaded and piled high with toppings. Fire up your grill :-). The first step is to grill your chicken! If you have time, soak the package of chicken in a sink with hot water for 20 minutes. Defrost them the chicken in the microwave for 5-8 minutes first. You want them to soften, but not cook all the way in the microwave. Increase the cooking time by 50%. You really want to ensure the chicken is cooked all the way through. Don’t forget to use a meat thermometer to ensure the chicken is 165 degrees inside! I took chicken thighs and added salt and pepper to each side. I then rubbed the chicken thighs with olive oil so they stay moist while grilling. 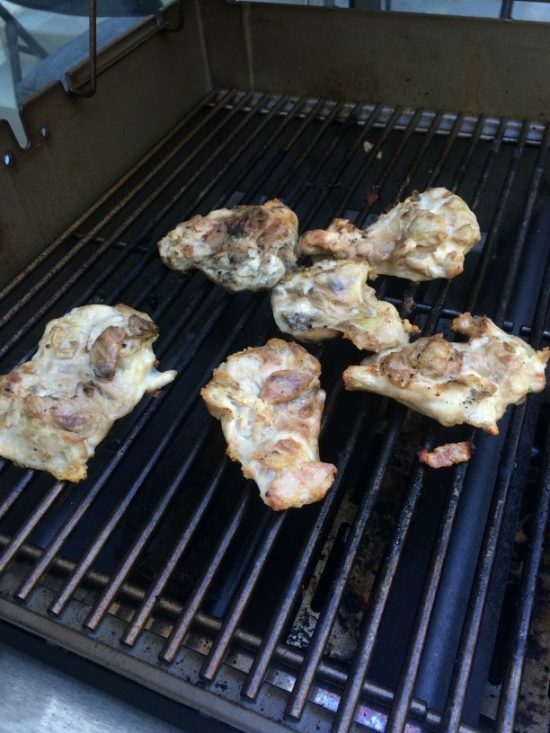 Remove the chicken from the grill and slice it thinly on a cutting board. Next, spread chips out onto a pan and load with the grilled chicken and sauce. Use as much or as little chicken and BBQ sauce as you like! 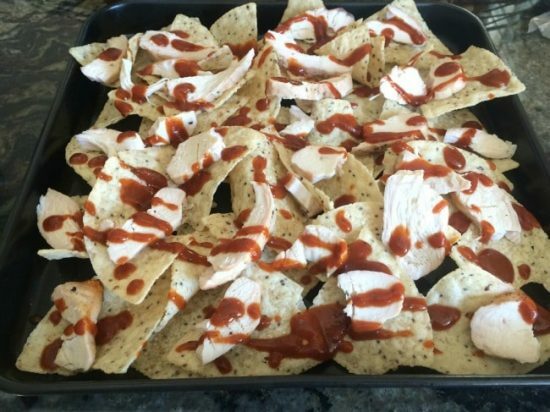 Bake the barbecue nachos for about 10 minutes until the cheese is melted. 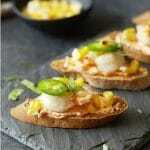 Garnish the top with guacamole, sour cream, diced tomatoes, fresh cilantro, and jalapenos. 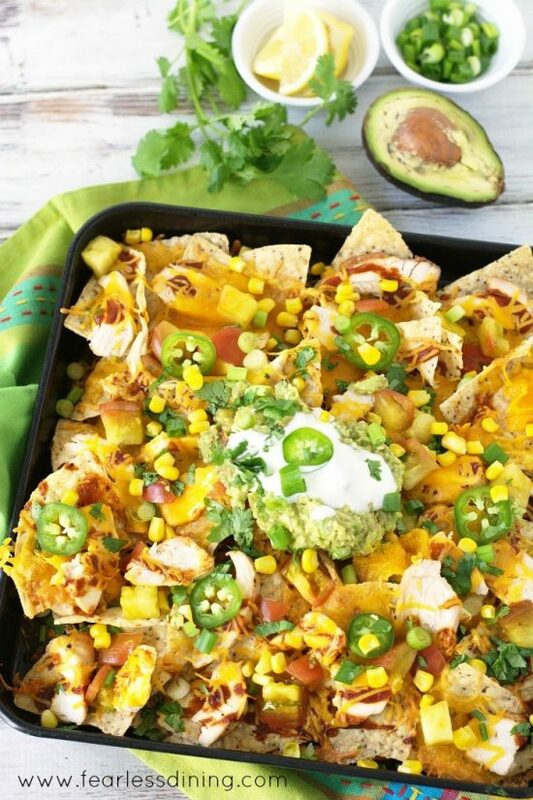 You are going to love these healthy chicken nachos! 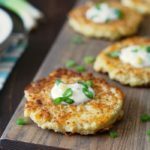 For more gluten-free appetizer ideas, check them out. Easy grilled BBQ chicken nachos. Rub chicken thighs with salt and pepper. Brush each chicken thigh with olive oil. Grill until thighs are at 165 degrees. Remove, cover with foil and let thighs rest for 5 minutes. In a baking tray, add chips. Sprinkle barbecue sauce and chicken. 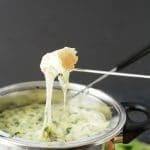 Bake at 350 degrees for 10 minutes until cheese is melted. Top with tomatoes, corn, guacamole, sour cream, and jalapenos. 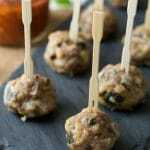 More Yummy Appetizers for Your Tailgate Party! I’ve always made nachos with ground beef, but this looks good. Nachos and bbq chicken are a great combo. 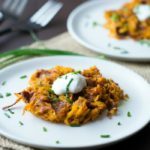 These BBQ Chicken Nachos combine two of my favorite types of food! BBQ and Mexican Food! Yum! I love making BBQ Chicken nachos. I have to try this recipe. One of my favorite toppings is fried onion strings. They are so good. That is pure genius. We love fried onion!! I’m always looking for an excuse to dive into a plate of nachos! These look divine! Yum!! You can’t go wrong wit BBQ chicken OR nachos! Having them combined into one dish sounds perfect, especially for a group of hungry guys watching the game. Great idea! Yum! 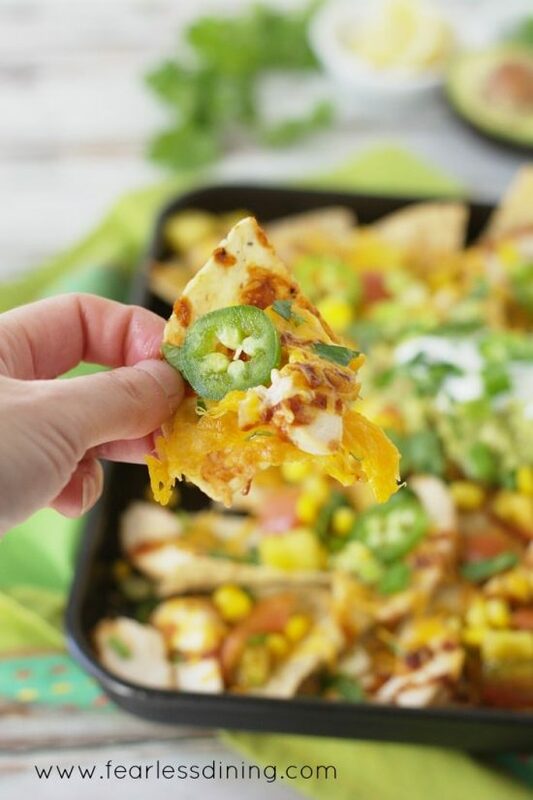 These nachos are fantastic, the mix of flavors is perfect for me! Yum! So perfect for game day! I love all that color. Also love that you included tips for working with frozen chicken. I always forget to pull mine out of the freezer. LOL I always forget to defrost my chicken! I saw this and immediately started to drool ! I want!!! These look great! Nachos are such a guilty pleasure for me. These look THAT good!! Amazing! !